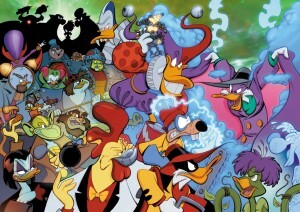 A Disney Afternoon favorite returns to comics as Joe Books (a new publisher out of Canada) presents the continuing adventures of Darkwing Duck — as written by Aaron Sparrow and illustrated by James Silvani, who previously illustrated the Terror That Flaps In The Night for Boom! Studios. This new series picks up where the Boom! series left off — but first, they’re bringing together the complete Boom! adventures of the hero of St. Canard (all 16 issues) in one massive, 400-page full-color trade paperback, Disney’s Darkwing Duck: Definitively Dangerous Edition. Read all about it over at Comic Book Resources, including an interview with James Silvani. Look for the book this January.